Peg Perego IS off! Just a few careful moves are enough to ensure your baby maximum safety. Safe and cozy inside this car seat, your baby will soon find out that traveling is a treat and that daddy’s car can be as comfortable as home itself: the safety belts, the side protection wings to delicately support the baby’s head, have all been specially designed to enable the whole family to set off even on long journeys in total comfort and peace of mind. 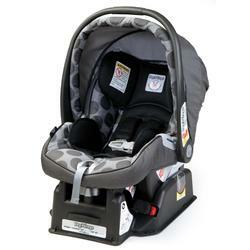 Upon arrival, moving the car seat from the car to the chassis is done in a flash, thanks to the easy-to-use handle. Qualified to the most stringent safety standards in the world. Side Impact Protection certified to EuroNCap tests. Travel System-compatible – the perfect complement to any Peg Perego stroller. Exceeds the most stringent Side Impact Protection test in the world. Adjustable Side Impact Protection is easy to adjust in 5 vertical positions. Headrest and padding made of soft “Confort dry” microfiber cloth that stays dry and allows proper ventilation. Quick-release 5-point safety harness with shoulder pads and fail-safe buckle. Includes a special removable cushion for newborns. Primo Viaggio’s remote LATCH connectors on the adjustable base are easily attached to the lower LATCH brackets built into most newer vehicles (or the base can be secured with seat belts); then the car seat can be easily snapped into the base. Easy to level base with enhanced side-to-side stability, anti-slip rubber underside and convenient carrying handle.